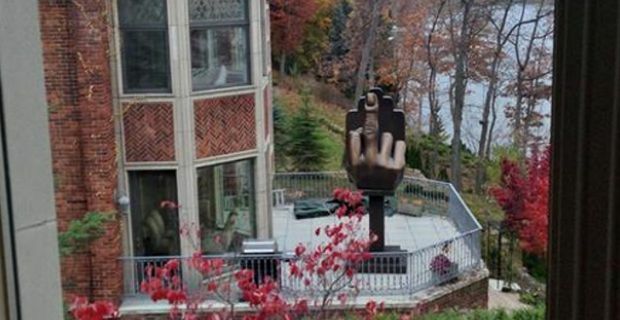 American entrepreneur trolls ex-wife with giant middle finger sculpture in his back garden – in front of her house! A giant bronze sculpture of the universal gesture known as middle finger was erected in Oakland by an estranged husband as token of eternal hostility. After what's been reported as an abrupt separation, the man first bought and moved in the house next door to his ex-wife's home, then had the 12-foot-high sculpture erected in his garden, which faces directly the woman's porch. The giant piece of garden ornament stands out very visibly and is also illuminated by a spotlight at night. Least but not last, it was unveiled to loud cheers during a private party last week. Lenka Tuohy, a woman believed to be daughter of the ex-wife, posted a picture of the bronze statue on Twitter. She also commented: “How psychotic do you have to be to buy the house directly next to your ex wife and then put a statue up like that?!?! Real classy alan,”. The next day she added: “its hard for me to enjoy my baths now because my fav tub is in my moms bathroom which faces out towards tif and alans house:(”. We don't blame her. Mr Markovitz claimed that it is a coincidence he ended up living right next door to his ex-wife, who apparently moved into the property in Orchard Lake when they divorced. He said it was mostly karma at work, and that although friends have advised him to just let go, he simply won't because 'it's about principle'. $7,000 (£4,300) is the amount reported to have been spent on the giant bronze piece.